Yes, maybe this is the right place you are able to get something. ‘Buam-dong(부암동)’ was derived from the big holy rock which was two meters tall, not present at this time in this village. There was a legend that people could have a sun when they rubbed the stone on this rock surface as much as their age and leave their hand, then at a same time the stone stuck to it. It means that they could get a sun luckily. 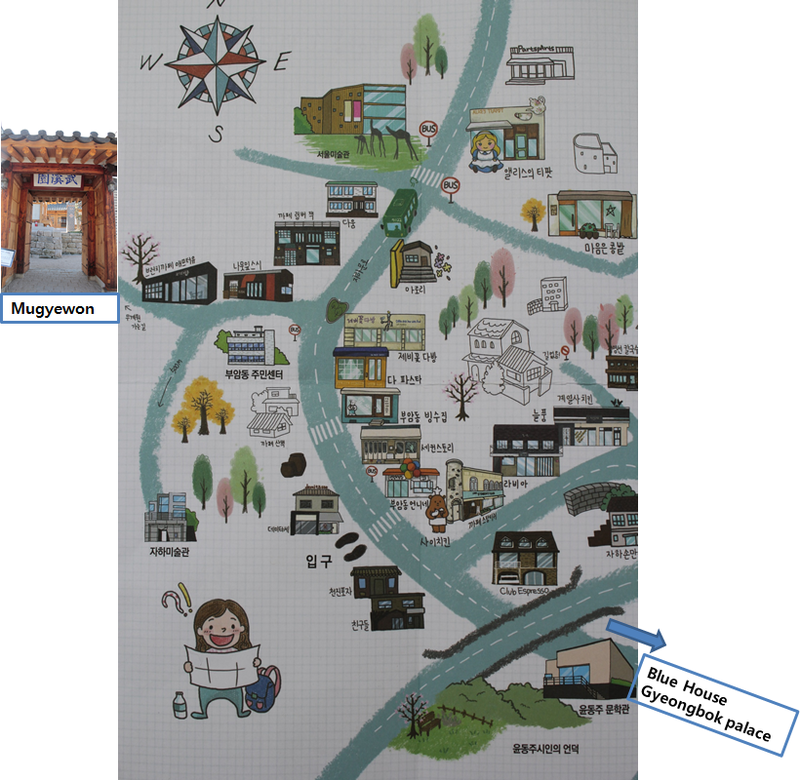 This village is located in the west foot area of the Bugaksan mountain(북악산) near the Blue House, the official residence of the President of South Korea and also at the foot of Inwangwan(인왕산). This has been a Limited Development District so long time due to neighboring the Blue House for president. Ironically thanks to this reason, here becomes the unique village having nostalgia for past. What’s more, by the effort of many artists, this area has filled with various museums, traditional craft shops, historical heritage, cafes and bakery and so on. This is small one. It did not take too much time to stroll this beautiful and tiny attractions. You can take a rest at the tiny cafes here and there hidden in the alley. This Hanok, Korean traditional house,was built by reusing the materials of Ojinam Korean traditional commercial restaurant which was demolished in 2010 and opened in Mar 2014. The main building materials of Hanok(한옥) are wood, stone and soil. Hanok was constructed in accordance with the method such as building blocks of Lego when connect wood to wood instead of using nail. So it is possible to build other similar kinds of building by using again with former frame. The particular feature of traditional house is in the formation of its garden. In case of Korea, they do decorate trees and flowers along the wall but planting on the center in the garden. In the past people did pursue simplicity in gardening. They only enjoyed the far away scenery which could be seen from their yard, not owned it like seen photo. This site has a history that Prince Anpyeong, very intellect and talent prince of painter, scholar, musician and calligrapher in his time, dreamed the beautiful peach garden and found out this place seemed just the like the place where he saw in his dream. He let the famous painter AnGyeon paint a picture ‘The Peach Blossom Spring Land’ and built the pavilion in this point. This name was named after the pavilion’s name stated in here at that time. He was the prince in the early Joseon dynasty when everything was unstable. Maybe it was not comfortable for him to live as a royal family without authority. I guessed that the dream was maybe the reflection of his earnest wish for peaceful real world. My heart went out to him. This space was reborn into the place of cultural center loved by the people. Several events and educational programs have been held such as experience of traditional tea, the humanistic education about Joseon Dynasty for citizens and visitor. I could hardly feel the age-long antique but I do not doubt that it would be someday. The small gallery with white roof greets me at first because the position is on the low ground. You can reach out by crossing the crosswalk from the official resident center(부암동 주민센타) on foot. This gallery was opened in 2013 by CEO Park to let all the people know the arts and Korean traditional culture of chopsticks. Various chopsticks in their color and shape are shown on the small dining table. Buam-dong seemed to be somewhat like dopy and battered an old car. However maybe that’s the real charming point of this place like old clock. Many master lived this village because it is next to Grand palace and supplied the their remarkable craftwork to the palace. This was the famous zone for outstanding handicraft workshops since previous dynasty To buy the only one thing in the world at these kinds of workshop is additional pleasure to me. What did I buy? I bought nice, wonderful handbag at the leather shop ‘BLUE LIM’ located on the opposite site of the official resident center. You won’t be disappointed. We are hosting special offer for #Travelers to #Korea on #NeoKOSIM Site. * Order till 30 June 2019, Spring Hot Deal! *How to use Coupon Code? -Put coupon code ‘neokosim15’ and Click "Apply Coupon". -if not follow the steps, you will meet "Sorry, this coupon is not applicable to your cart contents".